Summer vacation in 2007 brought me to Canada. My itinerary made me travel through Alberta, Saskatchewan, Manitoba as well as parts of Northwest Ontario. 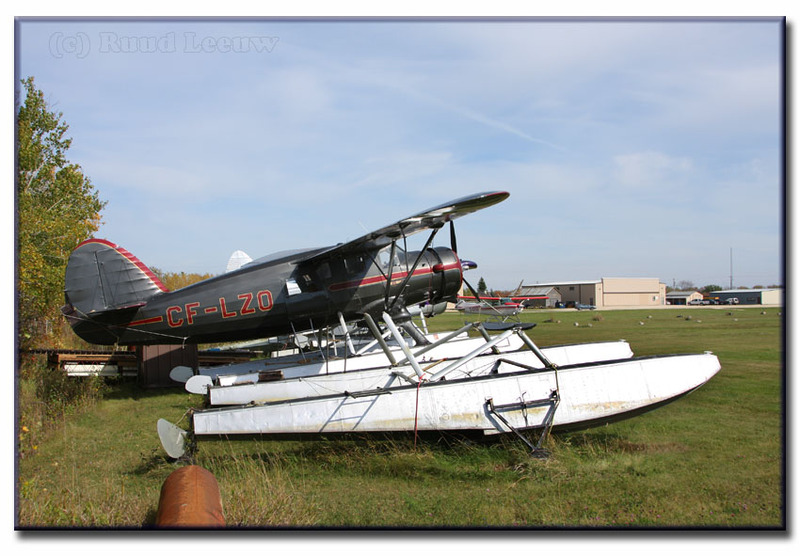 Selkirk in Manitoba was one place we stopped for a look at some float- & bushplanes. 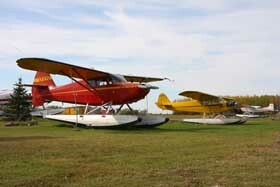 A modest seaplanebase (SPB) can be found just out of town. 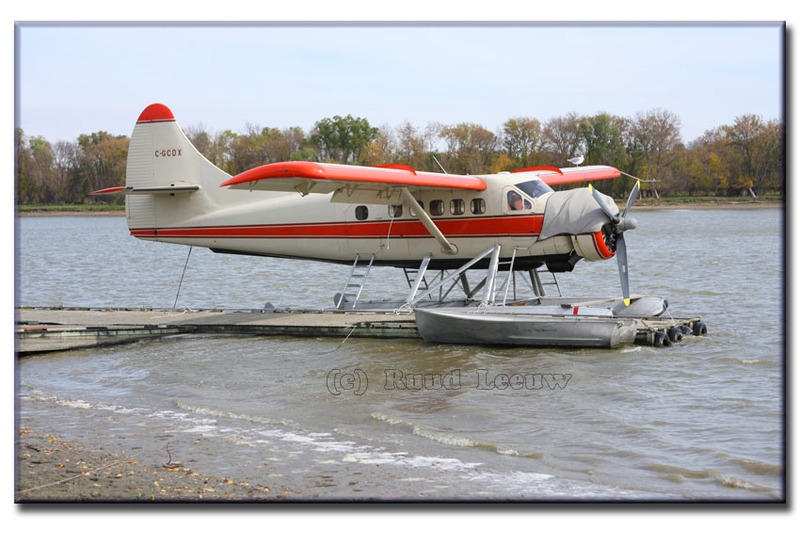 We found Dehavilland DHC-2 C-GMGV on the dock, awaiting a new flight assignment. Note the condition of the paint on the prop. History on c/n 432 as provided by DHC-2.com: Delivered on 31Dec52 as 51-16861 to the US Army, storage at Davis Monthan AFB from 05Sep73 to 29May74 brought an end to its military career. First civilian identity was N62278 for Vocational Centre of Washington,MN (no date) but it became C-GMGV when imported to Canada during 1980. On 28Sep81 it was registered to Athabaska Airways Ltd. of Prince Albert,SAS and was based at La Ronge. It was noted present at YPA/Prince Albert, SK. on 02Oct92. Next owner was T C Leasing Ltd. of La Ronge upon registration 29Nov95. From there it went to Knee Lake Air Service Inc. of Winnipeg,MAN (not surprisingly based at Knee Lake...), registered 21Aug2001. Knee lake is located on the straight line between Winnipeg - Churchill, a little over half way. My own files included 'C-GMGV registered to North Star Resort Inc, Winnipeg on 30Mar06'. The Transport Canada website offered the following data: registered to 3097448 Manitoba Ltd (trading as Adventure Air) on 05Dec07, based at Lac du Bonnet,MAN. (My date of writing 08Mar08). DHC-2 C-GPHI c/n 838 is on its way out, preparing for a departure into the wind on the Red River. You may have noticed the modicifation on the nose, it is longer than most. I am sure that will help the center of gravity going forward a bit. Delivered on 06Dec55 as 54-1696 for the US ARMY and stored at Davis Monthan AFB in Arizona from 15dec71 to 06Feb76. It was then registered as N67687 to Hillcrest Aircraft of Lewiston,ID (no date) and this tailnumber was cancelled on 17Aug76. During 1976 it was imported to Canada and by next year it became C-GPHI G &: M Smith, reg'd in April 1977. 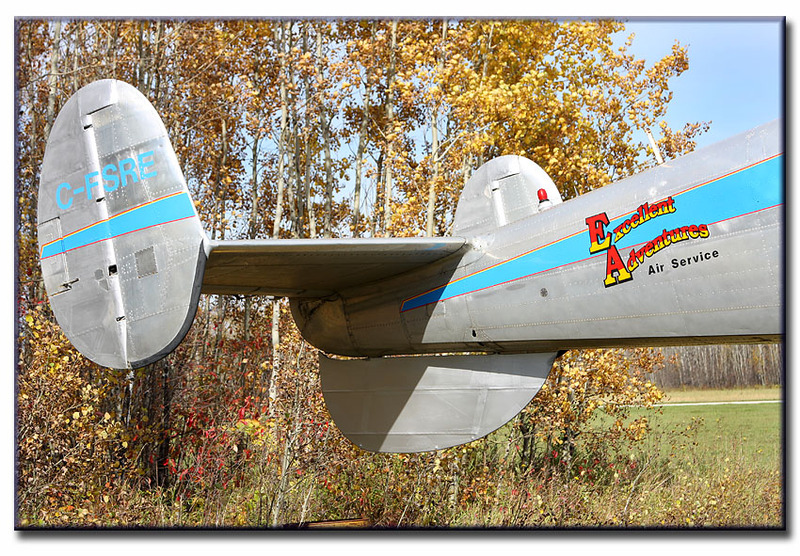 Next owner became Ignace Airways Ltd. of Ignace,ONT who registered it on 29Apr88. It sustained substantial damage when a float hit rocks on landing at Zig-zag Lake,ONT. (date 18Oct79). Trans Côte Inc. of Lourdes-de-Blanc-Sablon,QUE took ownership on 10Sep90 and next was Arnold Bros Transport of Edmonton,ALB (29Jan92). Sowind Air Ltd. of St. Andrews,MAN registered C-GPHI to its name on 28Apr93 and this lasted until 16Jan02 when it was cancelled. Enterlake Air Service Ltd. a.k.a. 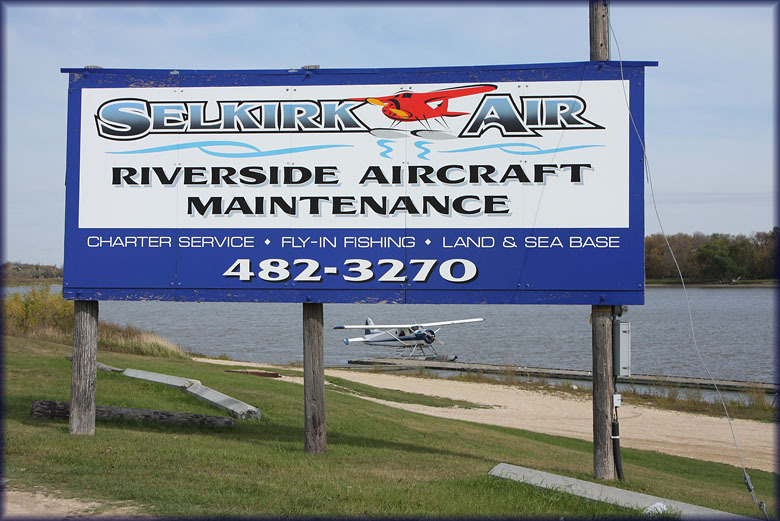 Selkirk Air of Selkirk,MAN is the present owner since 24Apr02. Otter c/n 314 was delivered to the United States Army on 3rd February 1959 with serial 58-1700 (tail number 81700). It was assigned to the 17th Aviation Company, Fort Ord, California until June 1964, when it joined the Otter Transition School, which was also based at Fort Ord, and where it served until February 1966. It was then assigned to another unit, identity unknown, until November 1968 when it was transferred to the 16th Combat Aviation Group, Vietnam. The Otter, and a Beaver, flew for the Group Headquarters, based at Chu Lai. It continued with this tasking until August 1969, when it was taken on charge by the 142nd Transportation Company, Da Nang and prepared to be shipped home. It arrived at the Sharpe Army Depot, Stockton, California in January 1970 and was stored there until February 1973, when it was deleted from the Army inventory and put up for disposal as military surplus. 81700 was one of four Otters stored at Stockton which were purchased on 8th January 1974 by Laurentian Air Services Ltd of Ottawa, the four being 76108 (226), 81700 (314), 81704 (316) and 92210 (348). The purchase price for 81700 was $6,500. Of the four, Laurentian Air Services flew two of them (226 and 348) to their base at Ottawa, restored them to civilian configuration and put them into service. The other two (314 and 316) were not in flyable condition (as reflected by the purchase price $6,500 for 314) and they were immediately sold on to Ag Air Company of Latah, Washington who collected the two Otters at Stockton and brought them by truck to their base at Latah.. 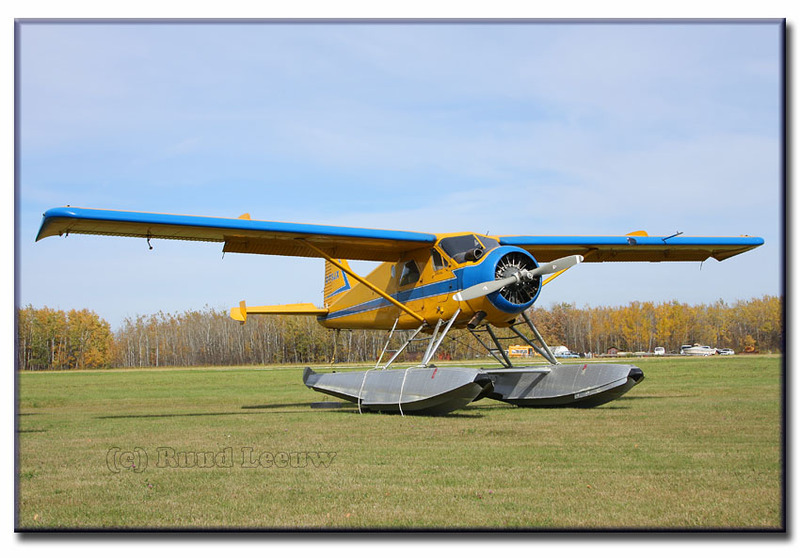 There they restored 314 to flying condition and then sold it on to Nipawin Air Services Ltd of Nipawin, Saskatchewan. 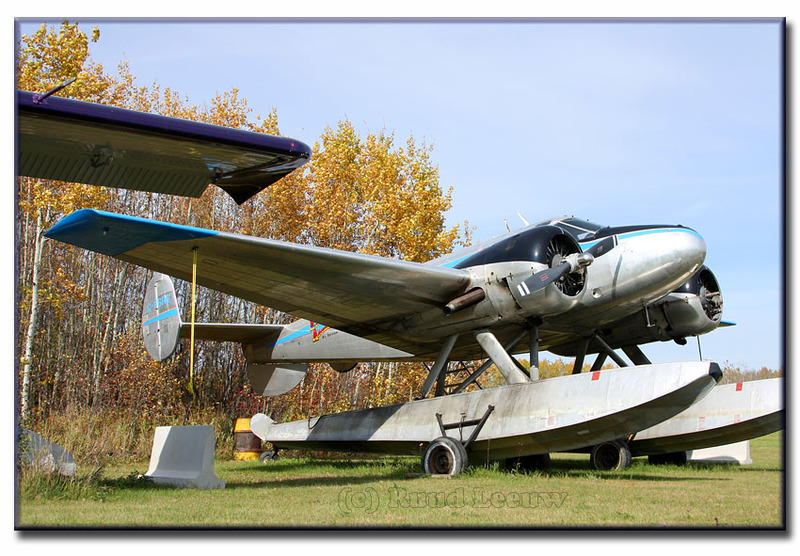 A temporary Certificate of Registration as C-GCDX and flight permit were issued on 24th June 1974 to Nipawin Air Services, to allow for the importation of the Otter into Canada from Latah, Washington. 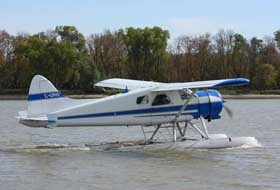 The Otter was then formally registered to Nipawin Air Services on 15th July 1974. 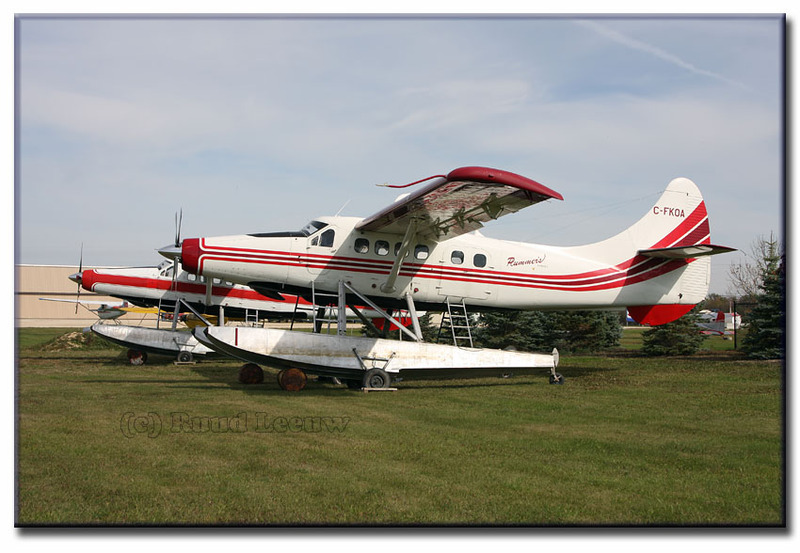 C-GCDX was to fly for Nipawin Air Services for nearly four years. 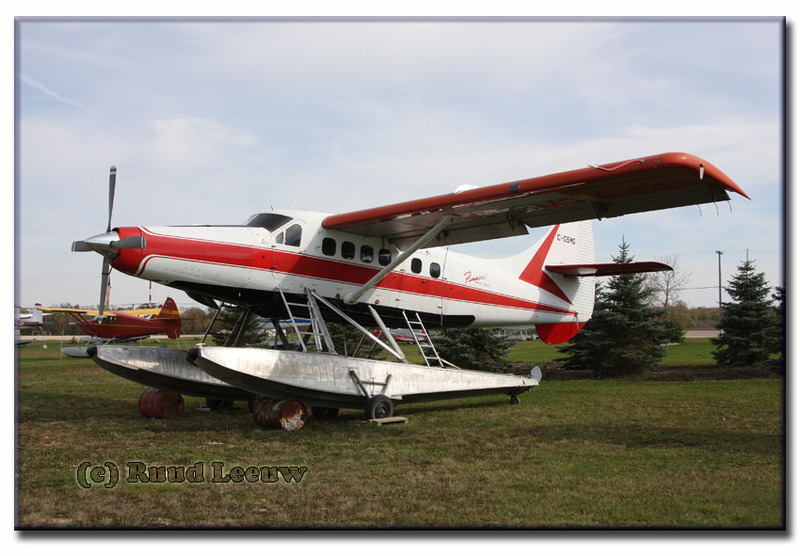 Its career with this operator came to an end on 4th May 1978 when it crashed at Otter Lake, Saskatchewan, landing on a strip 2,500 feet long and 75 feet wide. Directional control was not maintained after the tailwheel touched down on the landing roll. The Otter veered off the runway and down an embankment. Considerable damage was caused and two of the three on board sustained minor injuries. 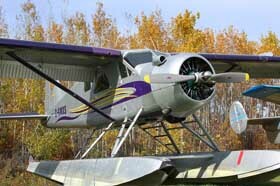 After repair, the Otter was sold to Bearskin Lake Air Service of Big Trout Lake, Ontario, to whom it was registered in 1980. The Otter recorded another incident on 15th March 1982 at McDowell, Ontario. The pilot was flying circuits and landings in an attempt to pack the snow on a ski-strip. On the fifth landing, the left ski link bracket failed and the aircraft settled onto the left wing. 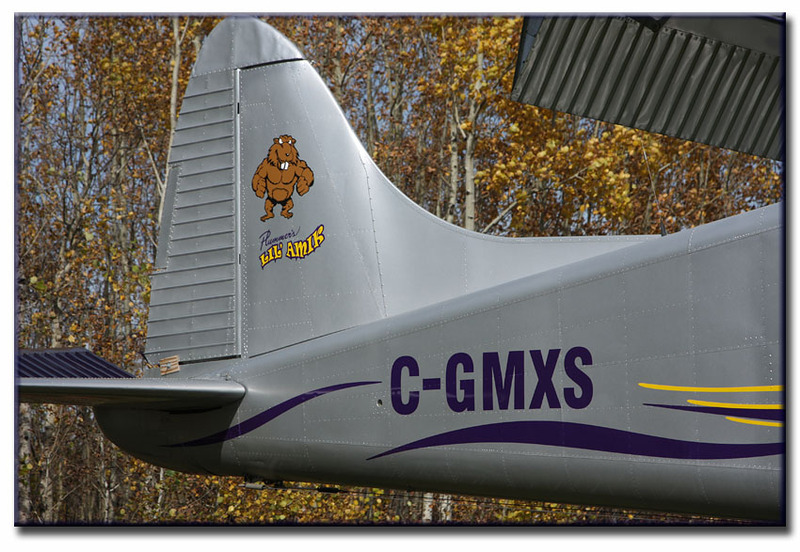 The damage was repaired and CDX continued in service with Bearskin Lake Air Service until sold to Allen Airways Ltd of Sioux Lookout, Ontario in August 1993. 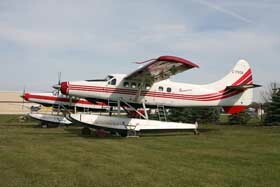 It flew for that company until sold to Selkirk Air Service Ltd of Selkirk, Manitoba in 1995. They arranged for it to be re-engined with a Polish PZL one thousand horse power engine. 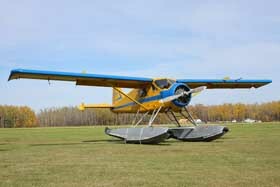 Selkirk Air purchased a conversion kit from Airtech Canada and carried out the conversion themselves at their Selkirk base. 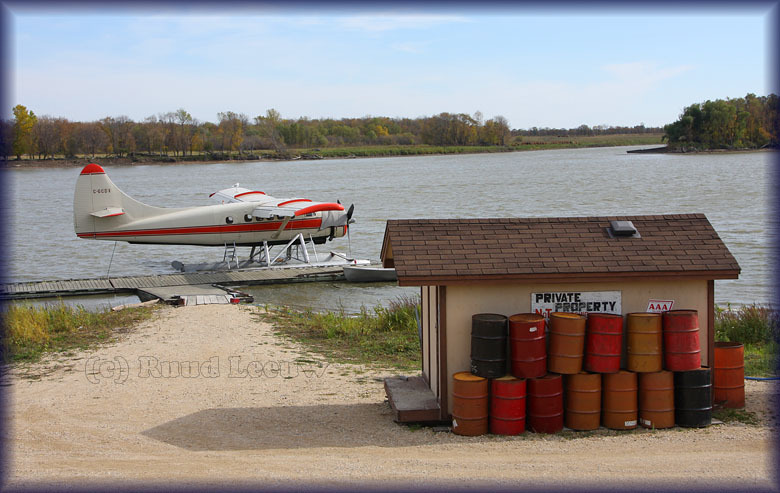 On 30th June 2001 at Wrong Lake, Manitoba, 'CDX was started up and pushed away from the dock. A gust of wind swung the aircraft around and the pilot applied engine power to try to compensate. The combined engine power and wind pushed the aircraft into trees and rocks, causing damage to the right float, right wing tip and propeller. 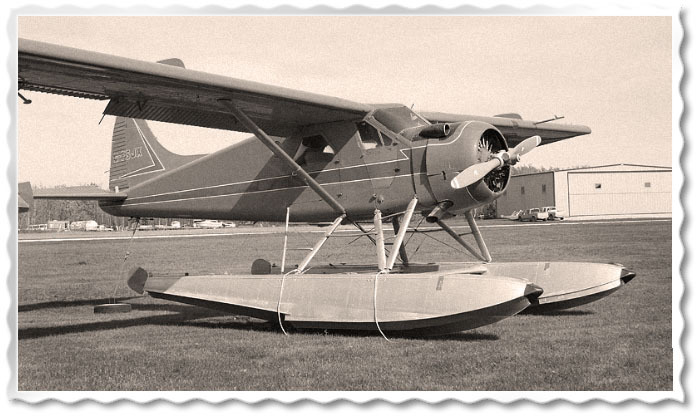 The damage was repaired and the Otter continued in service with Selkirk Air. During 2007 it was sold to Bald Mountain Air Service (Homer,AK) and on 23May08 registered as such with tailnumber N413JP. 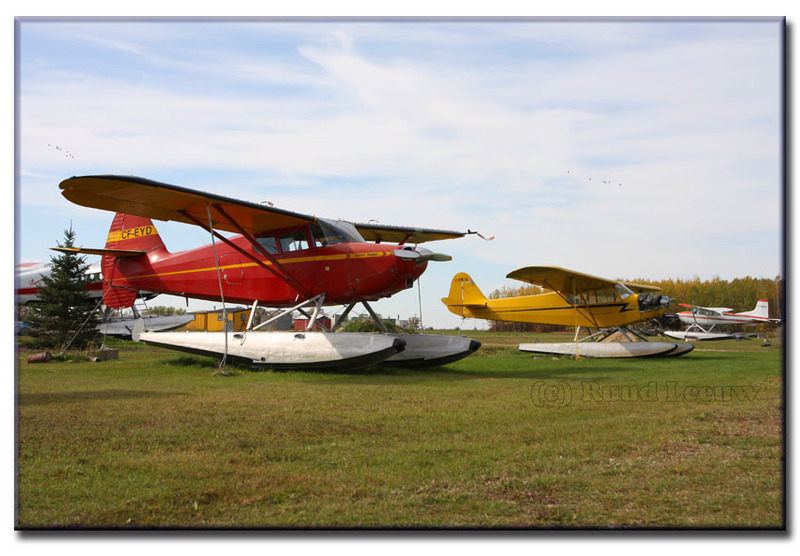 We shift our attention from the dock to firmer ground and notice a few planes already parked for the winter. Such as Stinson 108-2 CF-EYD (c/n 108-2127), registered to a privat owner, Stan Allen, since 29Jul99. C-FNUA is a Piper J3C-65 (c/n 15387), registered to James Mackenzie since 04Aug61 ! 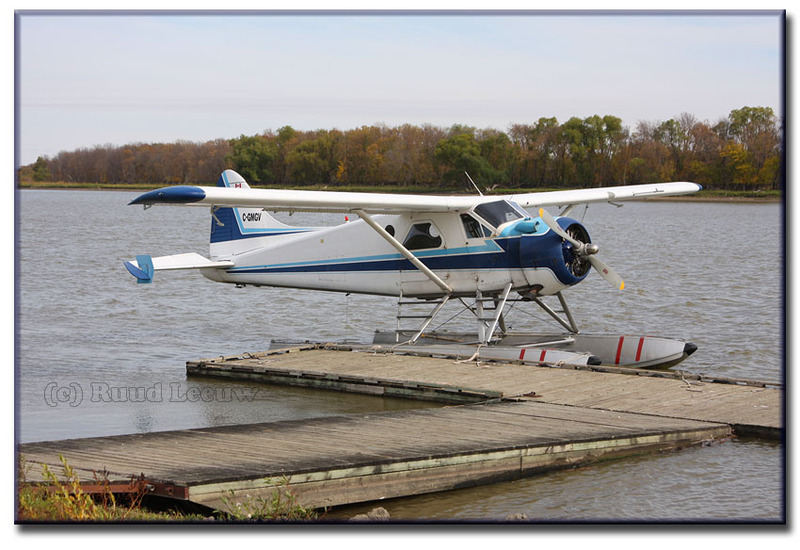 Cessna 180 C-FJNO has c/n 31559 and has been registered to William Ronan since 08Mar90. 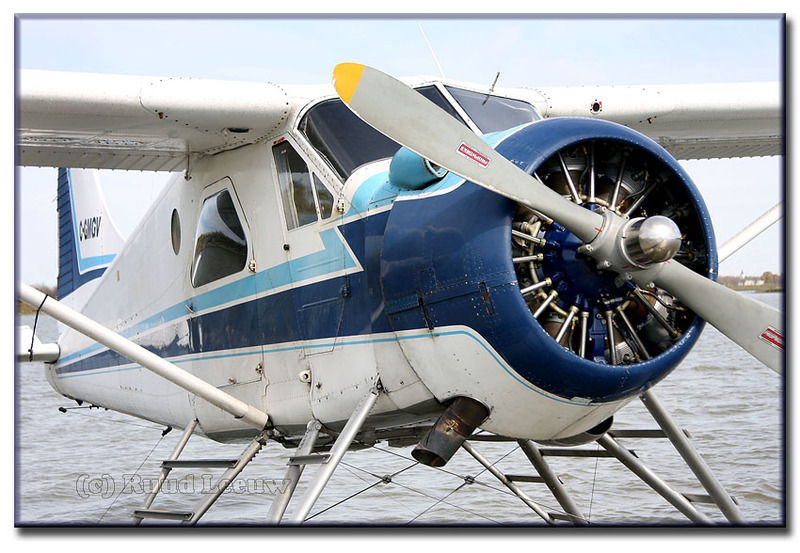 Now, if I'd like to see turbine powered aircraft, I'd rather see them turbines on DHC-3 Otters! 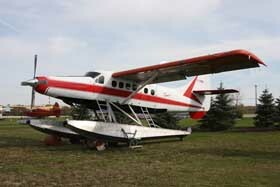 Otter c/n 363 was delivered to the RCAF on 12th May 1960 with serial 9405. It was allocated to 402 Squadron at Winnipeg, as was 9403 (359). These two served alongside the Squadron's Beech C-45 Expeditors and were later joined by 9415 and 9416. Otter 9405 was involved in the search for Piper PA-22 CF-IGO on 17th November 1963, flying alongside 9403 on that mission. 9405 is mentioned in the 402 Squadron history for an incident on 29th March 1965: “After an engine failure caused by the breaking of an exhaust valve rocker arm, 9405 made a forced landing on a snow-covered lake twenty miles west of Armstrong, Ontario. It was undamaged”. The Otter is again mentioned in the history of the RCAF Station at Armstrong. On 29th June 1967, Cessna 175 N7022M crashed en route Capreol to Sioux Lookout. As the history records, on 2nd July '67 Winnipeg SAR sent Otter 9405 from 402 Squadron and it located the wreckage of the Cessna 75 feet from the top of a cliff. Sadly, there were no survivors. On 24th September 1968 the Otter was returning from a supply drop. The pilot made a heavier than normal landing under gusty wind conditions. Skin wrinkling was discovered in the area of the tailwheel. The pilot had elected to land in wind conditions which exceeded limits by 7 mph. 9405 continued to serve with 402 Squadron until February 1976. On 1st March 1976 it was assigned to 2 Air Reserve Wing at Downsview, Ontario for use by 400 and 411 Squadrons. It flew from Downsview until being ferried to the Mountain View storage depot, Ontario on 9th December 1981. It was advertised for sale by the Crown Assets Disposal Corporation with a total airframe time at that stage of its career of 8,027 hours. It was sold at an auction held in February 1982, the purchaser being Sioux Narrows Ltd to whom the Otter was registered C-GSMG in July 1982. This operator was owned by Warren Plummer and was used to service the sports fishing lodges he had established on Great Bear Lake, Great Slave Lake and on the Arctic Coast of the Northwest Territories. The Otter carried 'Plummers Lodge'-titles. The fishing season runs from May to September in each year, guests typically arriving by chartered Boeing 737. Then the Plummers Lodge fleet took over for transport within the Northwest Territories. 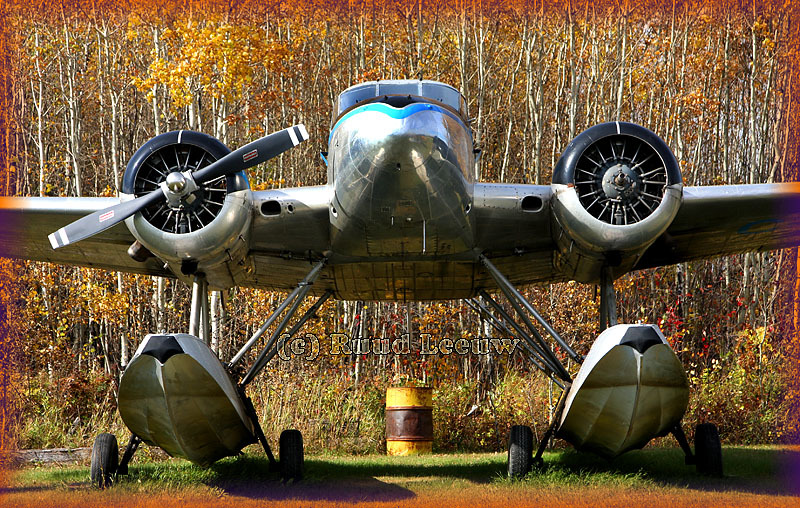 Their long-serving DC-3 C-FQHY connected the Great Slave, Great Bear, Trophy and Tree River camps and tied in to Yellowknife, carrying not only the passengers but fuel and supplies as well. 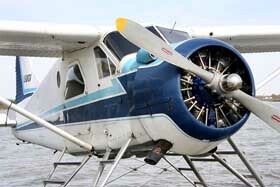 The Otter was used to take guests eight at a time from the lodges on special fly-outs to choice fishing spots. 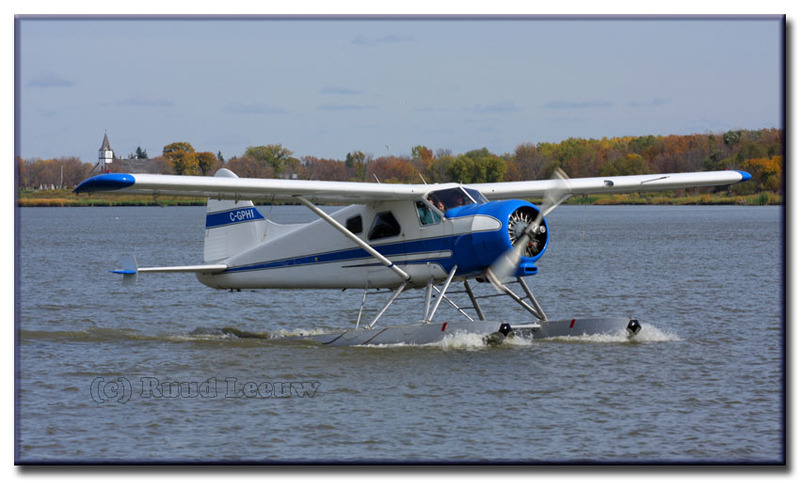 In 1990 Otter C-GSMG was joined by another Otter CF-KOA (130) and both were converted with Polish PZL-1000 engines. During September 1993, 'SMG was demonstrated to Air Tindi at Yellowknife, who were examining the Polish engine conversion. 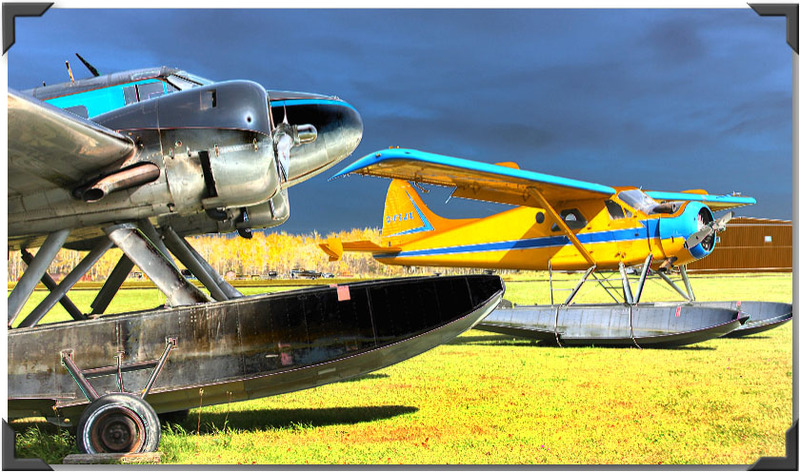 Both Otters fly for Plummers Lodge in the Northwest Territories during the summer months. At season's end, the fleet flies south to Selkirk, Manitoba for winter maintenance and storage. During 2005 the Otter was converted to a Texas Turbine, conversion no. 19, by Recon Air at Geraldton, Ontario. Otter c/n 130 was delivered to the United States Army on 20th June 1956 with serial 55-3281 (tail number 53281) and was assigned to the 2nd Aviation Company, Fort Riley, Kansas which later deployed to Germany, then France (as described in relation to Otter 124). By January 1962 the Otter was in the depot at Coleman Barracks, Mannheim, Germany as a maintenance float and in May '62 was allocated to SETAF in Italy, where it served until September 1963. Details of its subsequent military career are unfortunately missing until it arrived at the Sharpe Army Depot, Stockton, California in July 1968 for overhaul. It was transported from there to Vietnam where it was received in March 1970 by the 388th Transportation Company at Vung Tau. The Otter was allocated in August 1970 to the 18th Aviation Company and based at Qui Nhon, but its service with the unit was relatively brief, as it stood down in January 1971. The Otter was then placed with the 79th Transportation Company at Qui Nhon and was shipped back to the United States, arriving at the Army's Red River Depot in Texas in May 1971, where it was put into storage. It was deleted from the inventory in May 1972 and put up for disposal as “salvage”, apparently not being in the best of shape after its time in Vietnam. 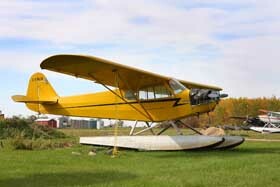 The Otter was sold on 15th February 1973 to J.W.Duff Aircraft Company of Denver, Colorado for $31,800. Duff Aircraft, based at Denver's Stapleton Airport, were a company which specialised in dealing in military surplus aircraft and spare parts. 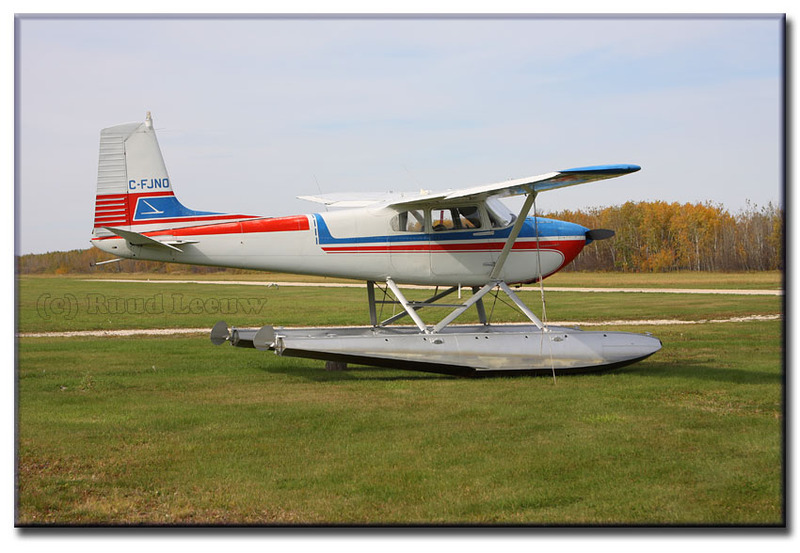 Very rapidly they sold on the Otter on 27th February '73 to Seneca Aviation Inc of Mena, Arkansas who proceeded to return the aircraft to flying condition. It was registered to Seneca Aviation Inc on 1st March 1973 as N88753 and performed a test flight at Mena on 12th April 1973 after rebuild and conversion to civilian configuration. The Certificate of Airworthiness was issued to Seneca Aviation Inc on 21st May 1973, at which stage the Otter had a total time of 3,553 hours on the airframe. 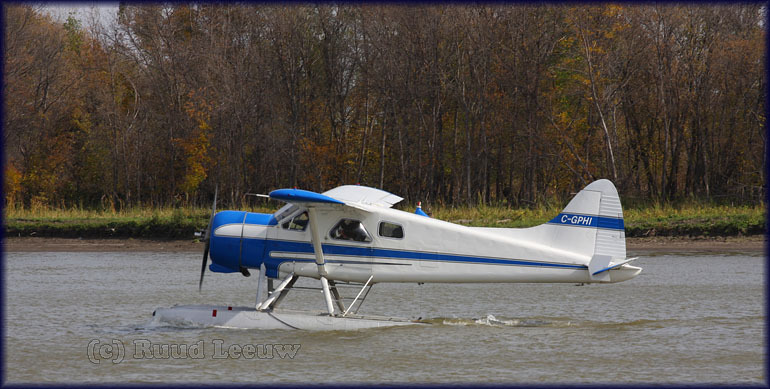 The Otter was put up for sale and the American registration cancelled on 26th October '73 on the sale of the aircraft to Lauzon Aviation Company Ltd of Algoma Mills, Ontario, to whom it was registered as CF-KOA. After five years service with this Ontario bush operator, KOA arrived in Calgary, Alberta on 4th March 1979. 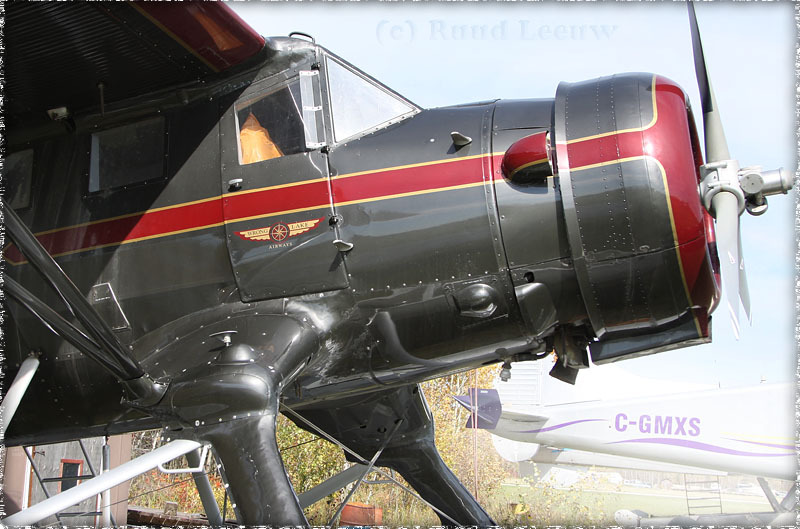 The 'Lauzon Aviation' titles were removed that week and the aircraft prepared for its next operator, which was Parsons Airways Northern Ltd of Flin Flon, Manitoba. It served with them for eleven years, until sold to Sioux Narrows Airways Ltd, to whom it was registered on 28th February 1990. 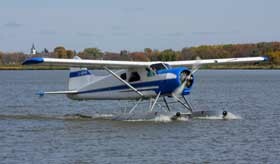 The Otter was converted by its new owners with the Polish PZL 1000 engine and joined another PZL-powered Otter C-GSMG (363) which also flew for Sioux Narrows Airways. This operator was owned by Warren Plummer and used to service the sports fishing lodges he had established on Great Bear Lake, Great Slave Lake and on the Arctic Coast in the Northwest Territories. The fishing season runs from May to September each year, guests typically arriving by chartered Boeing 737. Then the Plummers Lodge's fleet took over for transport within the Northwest Territories. 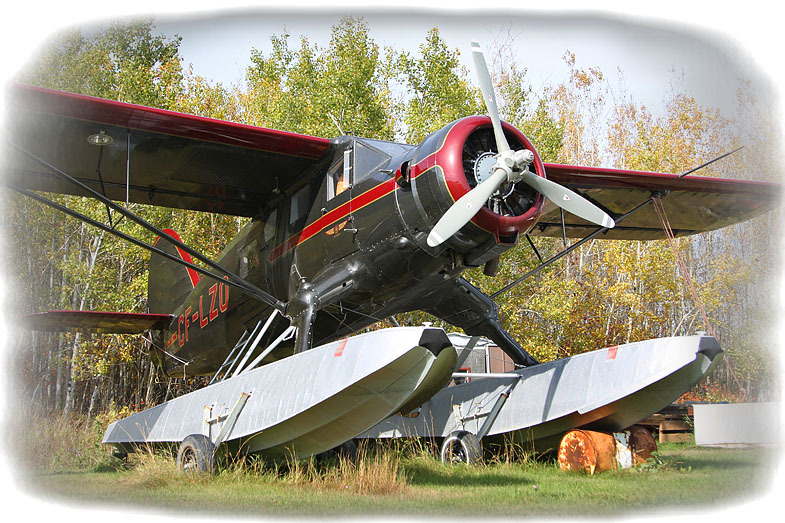 Their long-serving DC-3 C-FQHY connected the Great Slave, Great Bear, Trophy and Tree River camps and tied in to Yellowknife, carrying not only the passengers but fuel and supplies as well. The two Otters were used to take guests, eight at a time, from the lodges on special fly-outs to choice fishing spots. 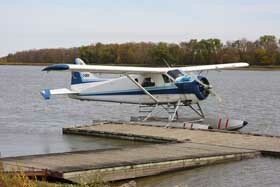 A Beaver and a Cessna 206 catered to smaller groups. 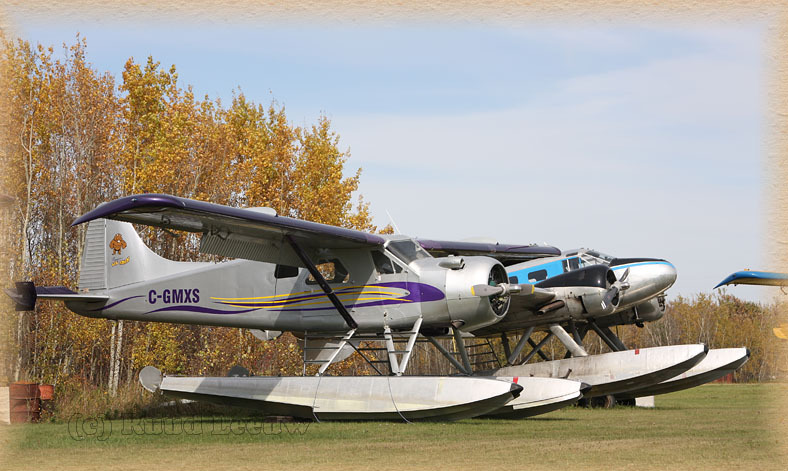 At season's end the fleet flew south to Selkirk, Manitoba for winter maintenance and storage. Two incidents were recorded during June 2001. 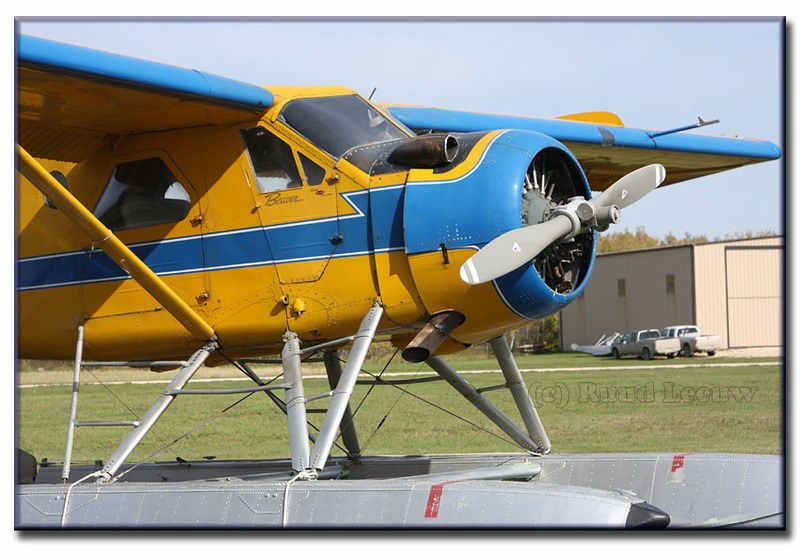 On 18th June C-FKOA was in the cruise thirty miles north of Thompson, Manitoba when the pilot noticed the carburettor temperature indicator was above the normal range. He elected to return to Thompson and landed without incident. Maintenance found a cracked weld in the exhaust system near the engine air intake. This was repaired and returned to service. 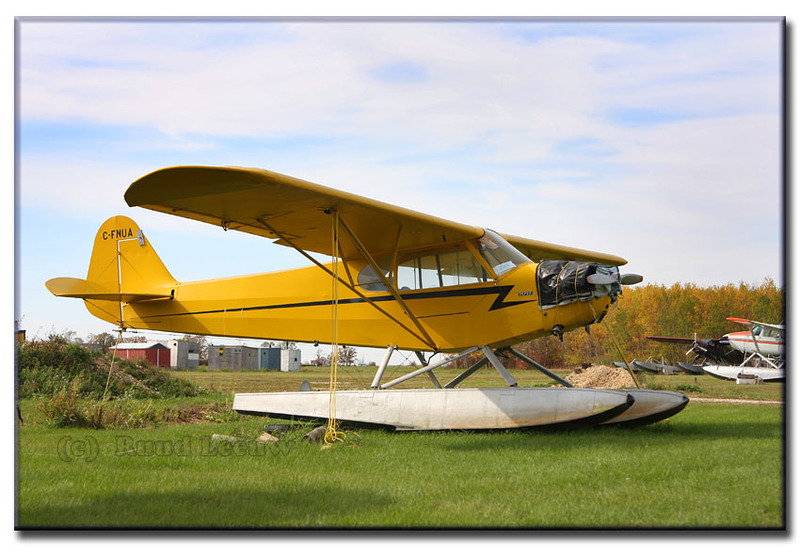 A few days later, on 27th June, forty eight miles west of Fort Resolution, Northwest Territories during the float take-off on a small lake, the engine failed. 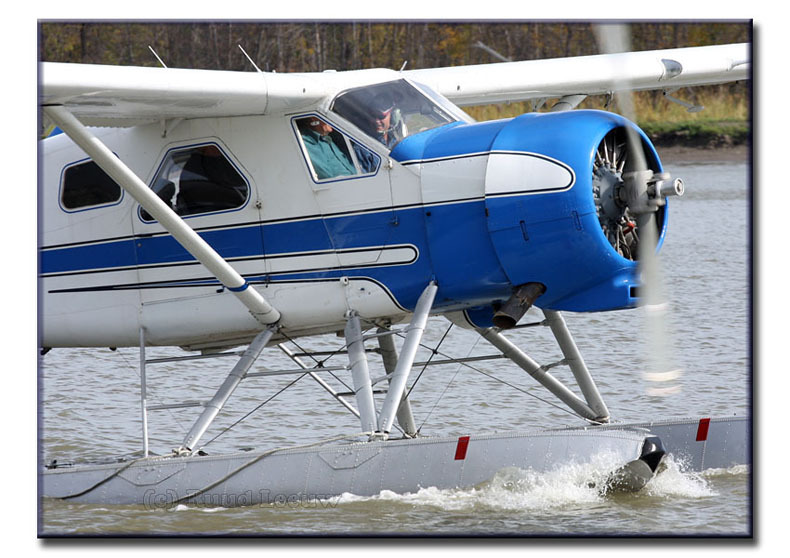 The pilot was able to land on the lake without damage to his Otter and relay his situation to Fort Smith through a passing airliner. Again the Otter was repaired and resumed service. C-FKOA was converted from a PZL to a Texas Turbine, conversion no. 26, at Recon Air, Geraldton,ONT. over the winter of 2005/06. 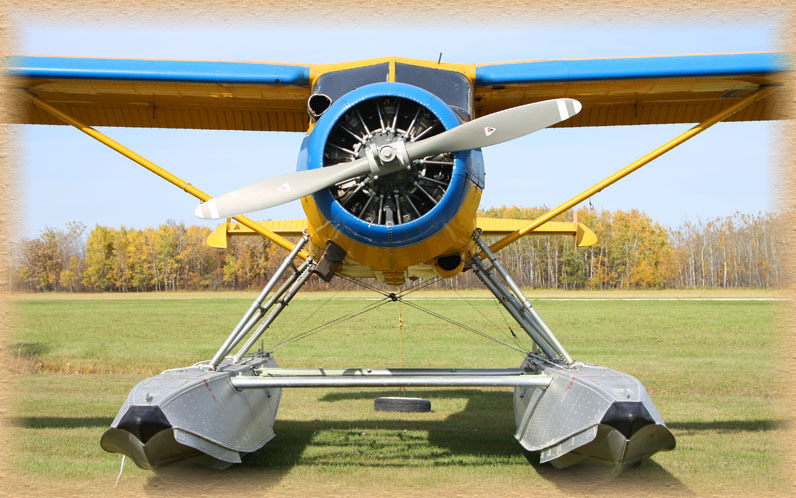 The Otter continues in service with Sioux Narrows Airways/Plummers Lodge. Delivered to the USAAF as aircraft No. 44-70270, it was assigned to Orlando, Florida. Assigned to the Reconstruction Finance Corporation, Cimarron, Texas on April 12, 1946 for disposal as surplus. Sold to the U.S. Forest Service and registered as NC66799. Imported into Canada as CF-LZO. Reported as having been involved in an accident at Lake Elliot (N50’23, W95’20) with the wreck salvaged in 1953. 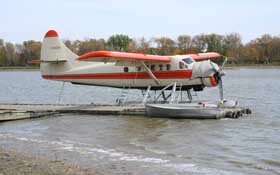 Registered to Riverton Airways Ltd., Winnipeg, Manitoba in 1961. C of A expired on February 20, 1962. Reported seen in Winnipeg in 1965 after rebuild. Registered to Arctic Enterprises Ltd., Yellowknife, NWT in 1966 and operated for Great Bear Lodge. 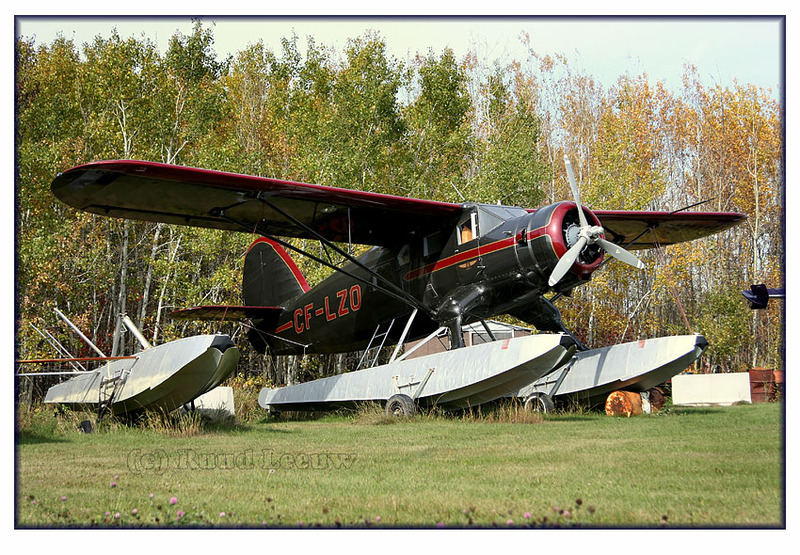 Registered to Minto Airways Ltd., Edmonton, Alberta in 1968 and then to Vanderhoof Flying Service, Vanderhoof, BC, in 1973. Registered to Raecom Air, Yellowknife, NWT in 1980. C of A expired on June 8, 1981. Registered to Raecom Air, Yellowknife, NWT. on June 26, 1983. Reported as having been exported to the U.S.A. in January 1985 and registered as N50646. Returned to Canada in 1989. Registered to 631948 Ontario Ltd. on May 25, 1989. 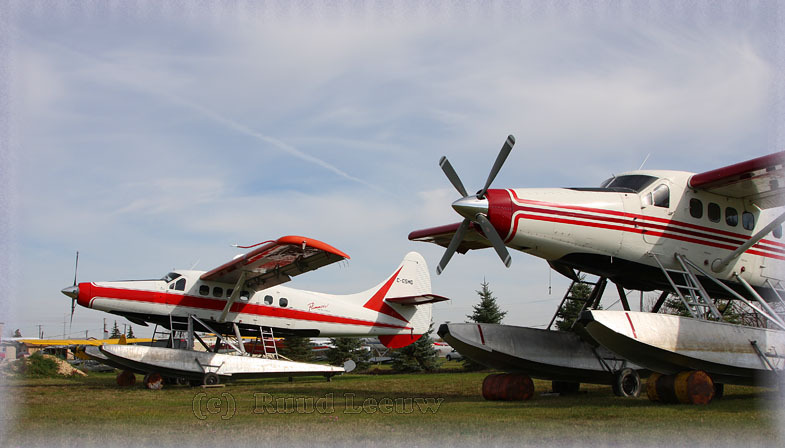 Registered to Kenora Air Service, Kenora, Ontario on May 17, 1990. (Leased from 631948 Ontario). Re-registered to 631948 Ontario Ltd. on December 14, 1990. Registered to W.A. Ferring (Caribou Air), Armstrong, Ontario on August 14, 1992. (Leased from 631948 Ontario Ltd.). Reported used in the filming of a movie. Re-registered to 631948 Ontario Ltd. on May 29, 1992. Registered to Wrong Lake Airways, Winnipeg, Manitoba on April 23, 1996. 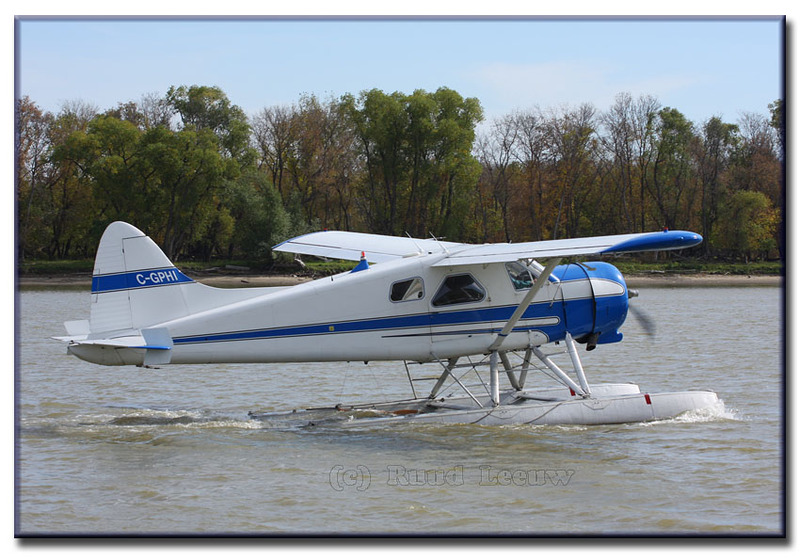 At the time of compiling this webpage, 08Mar08, Transport Canada shows CF-LZO c/n 535 being registered to Stoneboat Aviation 2000 Limited of Keewatin,ONT since 19Mar04. Delivered on 08Apr58 as 57-2567 to the US Army. Its first two civilian tailnumbers lack further details at the moment: N90946 and N5382G. 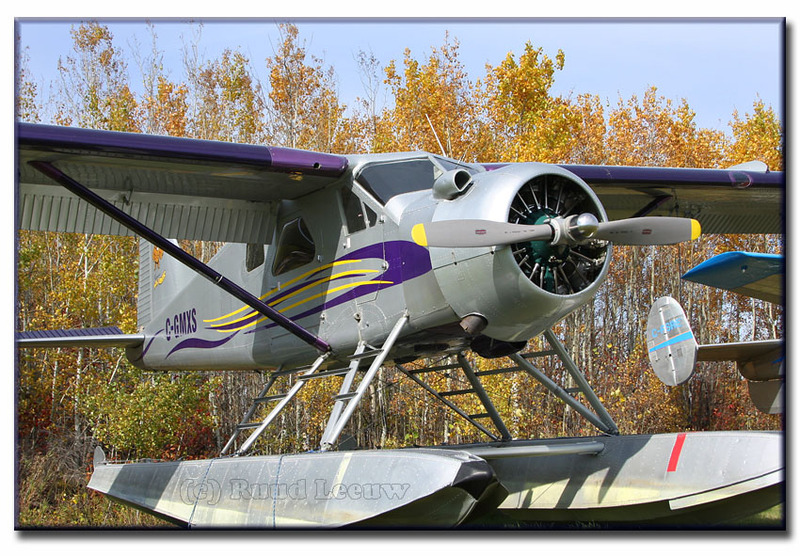 This DHC-2 was imported to Canada during 1981 and became C-GMXS for Hyack Air; reported in May81 at Vancouver,BC. It found a new owner/operator at Randair Ltd. of Alberta in 1984. Next was Pc Reid Outdoors Ltd. of Winnipeg,MAN to which it was registered on 11May87. But was cancelled again on 20Jun88. Then onto Latham Island Airways Ltd.of Yellowknife,NWT (no date) and Sioux Narrows Airways Ltd. of Winnipeg,MAN on 09Jun89. Air Tindi of Yellowknife had it registered to its name twice: 23Aug91 & 22Oct91. 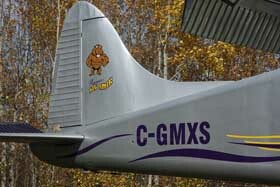 C-GMXS was leased from Latham Island Airways (1988) Ltd. of Yellowknife. Next operator is Venture Air of Thompson,MAN which it leased from P & D Aircraft Leasing Ltd. (registered 02May01 ). Fate hit a blow on 25Sep01, when it crashed near Big Stone River,MAN. No details (no report on CADORS), but as we can see: it was not fatal and 'MXS was repaired! Sioux Narrows Airways Ltd. of Winnipeg,MAN had it registered (again, see previously) on 08Aug03. Which means it also operates for Plummer's Lodges. 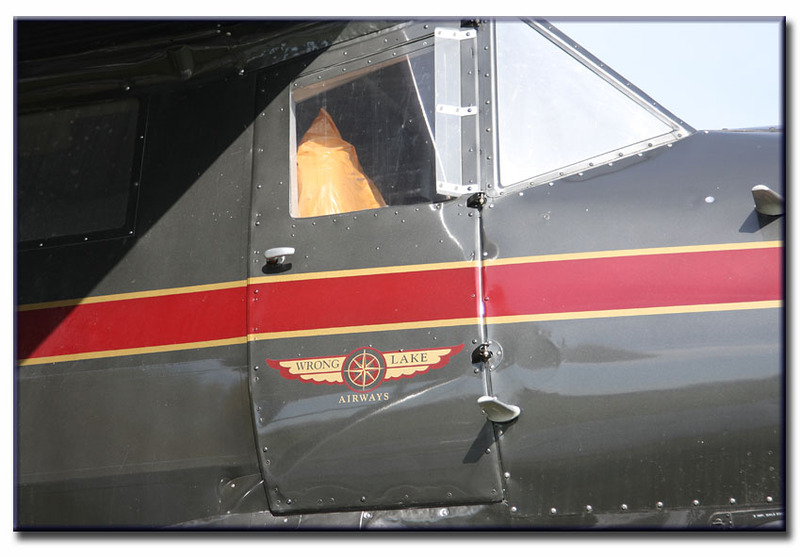 The TCa website has it registered to Sioux Narrows Airways since 17Dec01. Ah, the 'Twin Beech'... The DC-3 of the Bush, a.k.a. the "mini DC-3"! This is C-FSRE, a Beech 3N (c/n A-661 or altn. CA-61) of Excellent Adventures Outposts & Air Service Ltd. which is bases at Ear Falls on Ontario (see my report on Ear Falls). C-FSRE was registered to Excellent Adventures on 08Jun05 and no doubt it is here at Selkirk for some winterstorage & maintenance (note the prop missing). Next was St Andrews Airways of Winnipeg but this was terminated/cancelled on 16Jun82. Enterlake Air of Selkirk was next (no date) but this was soon cancelled, in 1983. 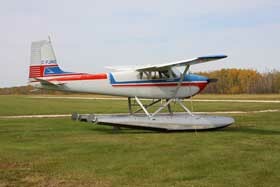 C-FSJX was assigned for Sabourin Lake Lodge Ltd. of Winnipeg, registered on 08May84 and again on 10Jun86. It was based at Sabourin Lake. And this is still current. 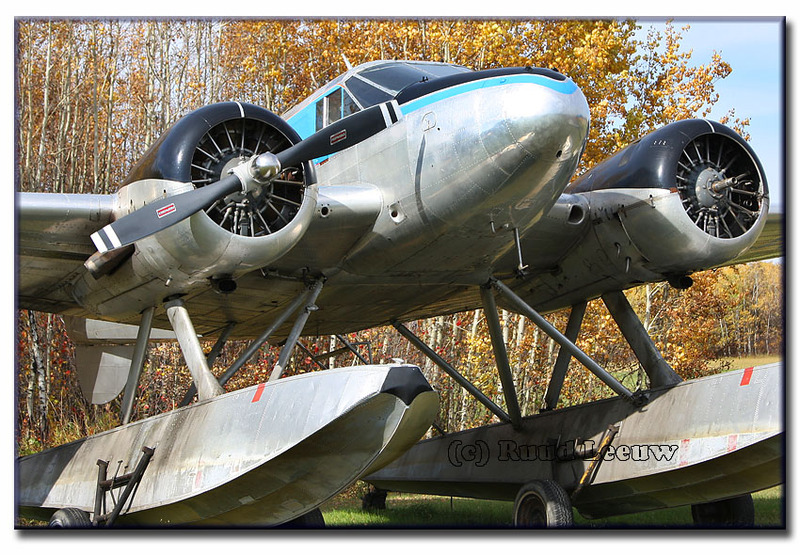 Thanks to Selkirk Air Riverside Aircraft Maintenance to allow this happy snapper to walk around, shoot his pictures !! Sorry, I could find no website to link to.